"Its main manufacture at this time is the making of gloves"
That gloving as a trade has been carried out in Yeovil for centuries was borne out in 1349 when the Bishop of Bath and Wells was assaulted by a crowd that included six Yeovil men; Thomas Skynnare, Nicolas Skynnare, Adam Tannere, Robert Bras, tanner, Hugh le Glovere and Philip Glovere - effectively men from three different related trades; skinners, tanners and glovers. The Bishop's Register described the Yeovil men as "sons of perdition forming the community of the said town." Another early reference to gloving was in a deed dated 1565, to which one of the parties was "John Boone, Glover, Yeavill,"
Gloving, however, had not always been the main trade of the town. In 1348, plague – the “Black Death” – reached England through nearby Weymouth, Dorset, and recent research confirms that about a third of the population of the known world perished. 50% of beneficed clergy in Somerset died between October 1348 and April 1349. Overshadowing the second half of the 14th century, the aftermath of the Black Death saw little in the way of expansion. Not only had the country lost many of its skilled artisans and craftsmen as well as its general labour force, but the high cost of the remaining workforce was prohibitive for most recovering parishes. In south Somerset, as elsewhere, one effect of the Black Death was the change from arable farming to less labour-intensive sheep farming. By the end of the 14th century, the county was producing about a quarter of English woollens and it was a time of great local prosperity as the town concentrated on the production of woollen cloth. Competition in the cloth industry led to a general decline in Somerset woollens and an increase in leather processing and glove production. in 1727 Daniel Defoe (of Robinson Crusoe fame) passed through Yeovil while travelling across the country gathering information for his book 'A Tour through the whole Island of Great Britain' and wrote of Yeovil "A market town of good resort, and some clothing is carried on, but not much: its main manufacture at this time is the making of gloves." The 1784 British Directory listed five glove manufacturers in Yeovil and in 1794 listed six "glovers, lamb and kid dressers". In the 1797 edition it reported of Yeovil "an extensive glove manufactory flourishes here which is considerably revived in recent years on account of the principal manufacturers importing and dressing their own kid and lamb skins." This is a veiled reference that the industry had been suffering due to the illegal importation of French-manufactured gloves. The British government had, from time to time, attempted to ban the import of French gloves by statute with ever-growing success and a consequential growth in Yeovil's fortunes. Collinson, writing in 1791, stated "There was formerly a large manufacture of woollen-cloth; but now the principal one is of leather-gloves, in which a great number of hands are constantly employed." and "a great many women constantly employed in glove-making". In 1822 C & J Greenwood, writing in 'Somersetshire Delineated' noted that "The woollen trade formerly flourished here, but the principal manufacture at present is that of gloves, which employs a great proportion of the population." In 1826, however, the legislation banning the entry of foreign-made gloves was repealed with a consequential catastrophic effect on Yeovil's gloving industries. On 21 May 1829 the Sherborne & Taunton Journal reported the following "The situation of our neighbouring poor who used to find employment in the glove manufactory in the town of Yeovil and all the adjoining districts, is, we regret to say, very distressing; and when we look at the extent of the importation of foreign gloves, we see little prospect of any improvement. The quantity imported this year to the end of the month of April is 24,813 dozen, which would have given employment for 100 days to 1,000 women and children for the sewing, and a proportionate number of men and boys in the dressing and preparing the leather." The following is from "The History of the Glove Trade" written by William Hull, a Yeovil glove manufacturer, in 1834. "The town of Yeovil, formerly much celebrated for its manufactures of dowlas, ticks, &c, has for nearly three centuries been so for the manufacture of gloves of the finer kinds, as well as military gloves. The latter is now in a state of decay, partly owing to improvident alterations in the military supply. These gloves are made from native skins. Imitation "Limerick" and "York tan gloves" were formerly made in Yeovil, but of late years very few. At present the manufacturers are employed in making men's and women's fine gloves, which pass in the retail shops under the denomination of kid gloves, but are, in reality, made from lamb-skins, imported from Italy, Spain, and Germany. These skins are mostly dressed into leather in Yeovil, in which place the manufacturers are leather-dressers, and large dealers in wool, as well as Glovers. The great importation of French gloves annually, is a complete check to the prosperity of the trade of this place; because, the moment that the Glovers, by reducing the quantity produced, endeavour to gain a remunerating price, the wholesale dealers in London give increased orders to the French manufacturer, and thus neutralise the efforts of the native manufacturer. The making of gloves from foreign skins has, for several years (owing to the unnatural competition with France), been so unprofitable as to occasion repeated applications to Parliament for protection, — hitherto without success. The non-remuneration of the Lamb Glove Trade in Yeovil has occasioned many of the manufacturers there, to become makers of kid gloves, in imitation of London-made gloves. The quantity of gloves made in Yeovil, of all sorts, may be estimated at 300,000 dozens annually; and the number of men, women and children employed in the place, and the adjoining districts (spreading over twenty miles), amounts, perhaps, to 20,000. The operation of the "free-trade system" on the town of Yeovil will be well illustrated by the necessity of maintaining one or two troops of dragoons continually in the town and neighbour-hood, where, a few years ago, a horse-soldier would have been looked upon as a sort of Centaur by the lower orders of the people." This, apparently, was a direct result of the furore caused by the 'Tolpuddle Martyrs' that had an alarming effect on Yeovil's glove manufacturers who feared the worst in these depressed times. In fact in 1834 the first trade union in Yeovil was created with some 200 glovers enrolled. But, in what amounted to a knée-jerk reaction by the leading manufacturers, with the assistance of local magistrates, the trade union was very quickly quashed. However Hull later added, as a footnote, "The dragoons have been lately withdrawn - the demand for gloves has increased" and, indeed, Yeovil's fortunes gradually changed for the better. 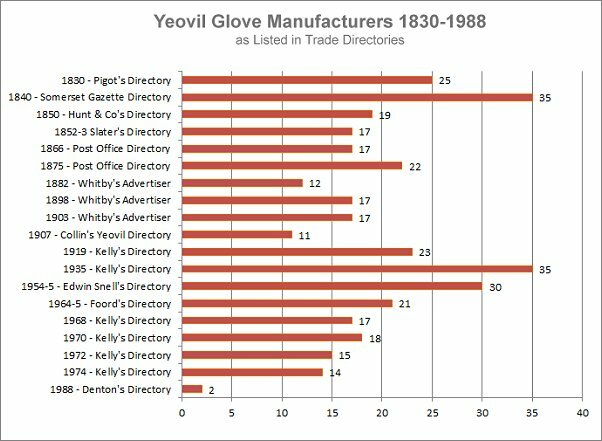 By 1840 there were 36 Yeovil glove manufacturers listed in trade directories as opposed to the six of 1794. Vickery wrote in 1856 "There are made upon the average in Yeovil, about 4,600 dozen pairs of gloves weekly, and in the neighbourhood about 3,500 dozen pairs; employing upwards of 10,000 persons. The wages paid yearly by the Yeovil manufacturers average in amount about £80,000; and by those in the neighbourhood, from £31,000 to £34,000. The wages average, to cutters when fully employed, from 25s to 30s per week; leather dressers 21s to 24s; dyers 20s to 25s; parers 18s to 21s; women 4s to 6s; girls under fourteen 1s to 2s 6d; boys from ten to fourteen, from 1s to 2s 6d; apprentices from 15s to 20s." For comparison, one pound or twenty shillings in 1856 would be worth about £80 at today's value, while one shilling would be worth about £4. It is little surprise therefore to learn that glovers generally were classified among the poorer classes and their relatively low wages meant that living conditions for the majority were very poor indeed. Nevertheless as the leather and gloving industries grew, so too did the population of Yeovil. In the 1820s the population stood at around 5,600 but by the 1890s has grown exponentially to around 13,500 and it has been estimated that between 70% and 80% of the town's population were involved in the leather, gloving and associated industries. Even by the 1830s the increasing population of the town had led to such overcrowding and very poor living conditions for the majority of the poor that steps were deemed necessary to improve the town's condition. This ultimately led to the creation of the Town Commissioners in an attempt to improve the general conditions in the town which, at this time, were all but Medieval with narrow streets, open sewers, and so forth. It is no coincidence that the majority of the newly elected Town Commissioners were, in fact, leading glove manufacturers including John Ryall Mayo, William Bide, Robert Tucker, Elias Whitby and Frederick Greenham. While their stance on trade unions was, perhaps, questionable, there could be no doubting of their earnest intentions towards the betterment of general conditions in Yeovil. The leather and gloving industries of Yeovil slowly increased throughout the latter half of the nineteenth century. There was a short hiatus at the outbreak of war in 1914 due to a lack of materials and a shortage of labour and at this time the industry came under Government control. Following the war there was a brief boom in the industry nationwide but this was not to last long and a long and gradual depression set in. The government lifted the restriction on the importation of German-manufactured leather gloves and at the same time America imposed a tariff on imports to protect its own manufacturing. In Yeovil the industries were further hit by the expansion of Engineering and aircraft production in the town, both of which could offer far greater remuneration to their workers than could the leather and gloving industries. Despite an inter-war boom in the gloving industry, with the number of glove manufacturers increasing significantly as shown in the chart below, after the Second World War the decline of the gloving industry hastened even further. In April 1989 the last of Yeovil's glove manufacturing companies, Freke & Gifford Ltd of Pen Mill Trading Estate, closed blaming cheap foreign imports, thereby ending a centuries-old craft industry in the town.